The 2019 Kentucky Derby is a party that members of the Albaugh Family Stable don’t want to miss. But to qualify a horse and continue its streak of Derby contenders, it’ll take a different sort of approach this season. The last three years, each of Brody’s Cause, J Boys Echo and Free Drop Billy picked up points as juveniles, including with a pair of scores in Keeneland’s Breeders’ Futurity (G1). But neither in an Albaugh duo pointing to upcoming prep starts are yet on the leaderboard. “We keep saying four in a row would be amazing,” said Jason Loutsch, racing manager for father-in-law Dennis Albaugh, a billionaire who founded the Albaugh Inc. agricultural chemical company. “Once you get a taste of it and you get three in a row, it would be a major letdown (to not go). Every year, that’s our goal. 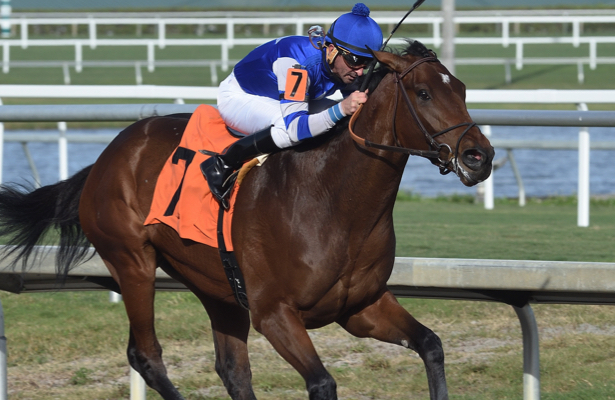 The road started Friday when Come On Gerry, a $335,000 purchase, broke his maiden at second asking in Gulfstream Park’s seventh race, a maiden special weight at 1 1/16 miles. While the track appeared to be speed-favoring, the son of Elusive Quality set the fractions and finished up well under little urging by trainer Dale Romans’ first call jockey, Robby Albarado. The final time was 1:44.12 for an easy 2 1/4-length victory. Come On Gerry, a tribute to Albaugh’s late best friend, is a regular workmate with Admire, another Romans-trained maiden special weight winner whose name is pronounced “add-mire” after a former Iowa sports reporter who now works as the voice of Drake University athletics. Loutsch said one from the pair will point to Gulfstream Park’s Holy Bull Stakes (G2) and a matchup with unbeaten Maximus Mischief on Feb. 2. The other will likely run in a points-paying Derby prep at Oaklawn Park or Fair Grounds. In addition to that pair, back in training after a freshening is Mr. Ankeny, who was sixth in this year’s Breeders’ Futurity (G1) and could head down a similar Derby prep path as his stablemates.